History began when humans learned how to read and write. The first writing we know of came from civilizations in Mesopotamia and Egypt about 5500 years ago. People lived for hundreds of thousands of years before this, but little changed from generation to generation. 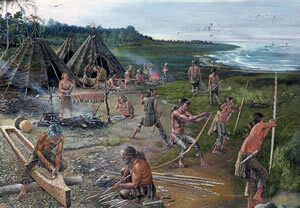 Prehistoric humans were nomads. Nomads are people who have no permanent home. Men hunted animals and women gathered wild plants. When there were no more animals to hunt or plants to gather, the nomads moved to a new place. Society developed when people began to do individual jobs. This is called the “division of labor.” When people do only one job, they usually choose a job they enjoy and do well. Further, when you do the same job over and over, you learn to do it very well. The division of labor caused people to depend on one another and eventually led to advanced civilizations. Eventually, people learned how to write. Writing allowed people to pass their knowledge onto others. Sir Isaac Newton once said, “If I have seen further than others, it is because I have stood on the shoulders of giants.” Sir Isaac believed that his accomplishments were possible because he learned from the people who came before him. Instant worldwide communication is one reason why our society is rapidly changing. In the last two hundred years, scientists have concluded that humans have lived on the earth for only a short period of the earth’s history. They believe the earth is about 4.6 billion years old. This estimate is based on radiometric age-dating. Certain objects emit energy; this is called radioactivity. Over time, the radioactivity causes the objects to decay. If an object has a half-life of one million years, half of the element causing radioactivity will decay over a period of one million years. The historical record becomes much more complete once we learned to read and write. The long period that preceded literacy remains shrouded in mystery, but the distant past did provide us with some clues. Download this lesson as a Microsoft Word file or as an Adobe Acrobat file. Mr. Donn has an excellent website that includes a section on Prehistory. 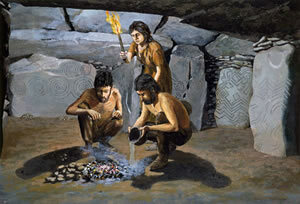 Barclodiad y Gawres, Isle of Anglesey, by Paul Jenkins, drawn about 1980; Ritual in a Neolithic passage grave, about 3,000BCE. Hunting and fishing at The Nab Head, St Brides Bay, Pembrokeshire, about 8,400BCE; By Giovanni Caselli, 1979. 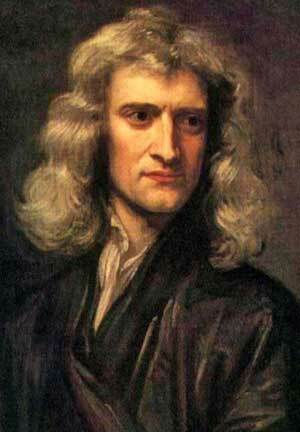 Sir Isaac Newton (1642 – 1727) is one of the most influential scientists of all time, but his credited his predecessors when he said, “If I have seen further than others, it is because I have stood on the shoulders of giants." This entry was posted in Prehistory. Bookmark the permalink.